Welcome to our 90th edition of Street update! Last week was all about Banksy and his Dismaland pop-up exhibition. 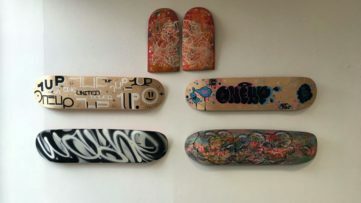 Since many of you probably got a bit tired of these endless reports on his Bemusement Park, it is time to see what else has been going on in the world of street art. With Sea Walls: Murals for Oceans Festival closing, we had the opportunity to see some of the best murals created by the participants. But there are always new festivals to follow and an interesting one may be the upcoming Nuart in Stavanger, Norway. If you haven’t checked our tour of must-see murals in Sheffield perhaps now is the right time. 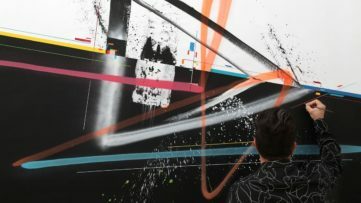 And if you’re interested in those inside stories about the graffiti world we recently shared an interview with MOST one of the most recognizable graffiti writers from Hamburg, Germany. 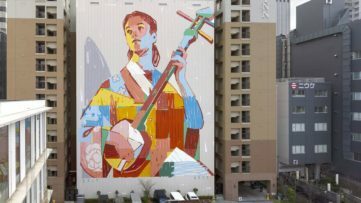 And now let’s cut to the chase and see some of the best murals created on the streets worldwide which you choose as your favorite on our Facebook page! Well, well, what a surprise. It is Banksy once again with his latest piece created at Weston-super-Mare. 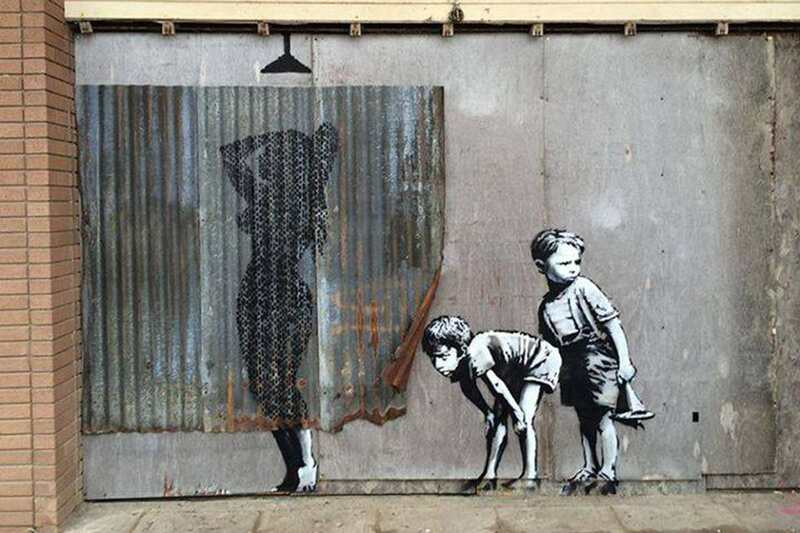 Humorous and witty, Banksy depicted two young boys peeking at a woman taking a shower behind the iron curtain. The latest work is perhaps one of the most joyful things to see in his dystopian theme park and surely one of the reminders of Banksy’s original street art practices created in his signature stencil technique. WD aka Wild Drawing seem to be one of the busiest muralists this summer. 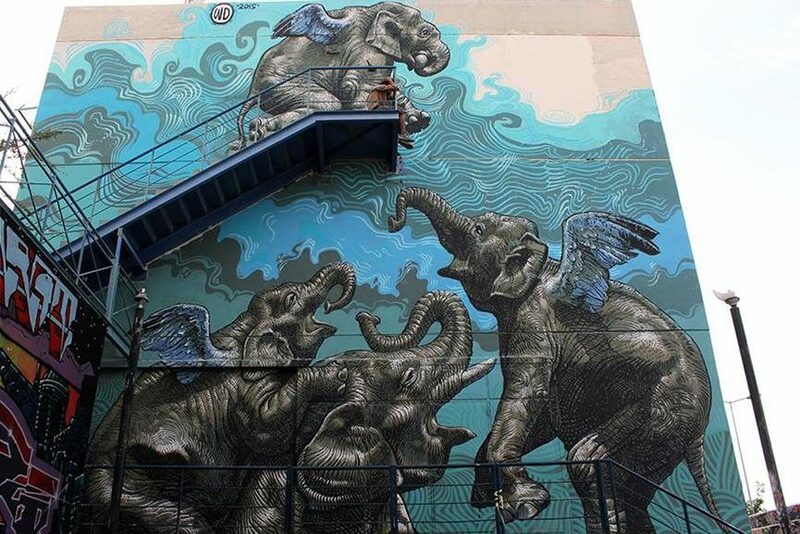 Every week one of his murals appears on the walls of major European cities and this time it is Athens. Entitled What if I fall? But imagine, what if you fly? the piece brings to life a group of flying elephants. Perhaps not what we expected since we are used to his politically charged expressions but it definitely is a spectacular work of art. 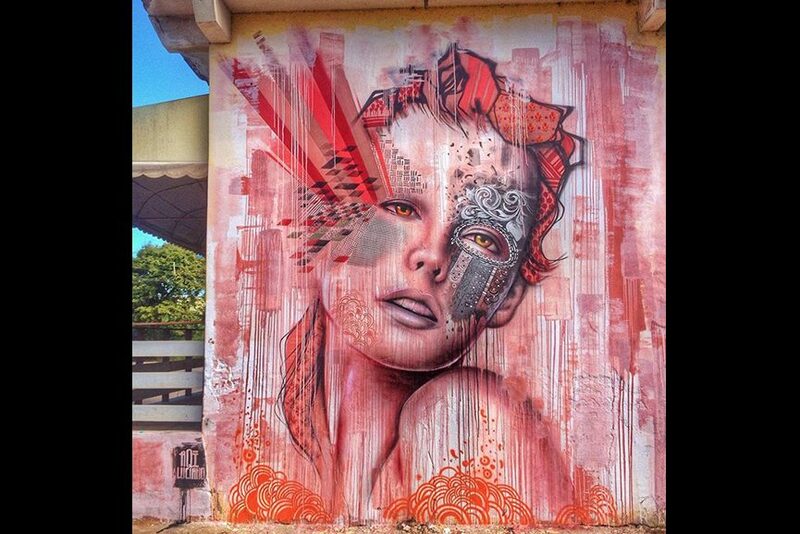 AQI Luciano is a Brazilian graphic artist who became part of the Brazilian street art scene in the mid-2000. His career as a street artist started on the walls of Vila Vehla, city in the Espirito Santo state and this is where he just finished his latest large-scale mural project. Throughout his work AQI Luciano explores the notion of female beauty through various styles and this recent engagement resulted in yet another beautiful woman portrait. Christina Angelina, Venice-based artist is one of the leading female figures when street art is concerned. 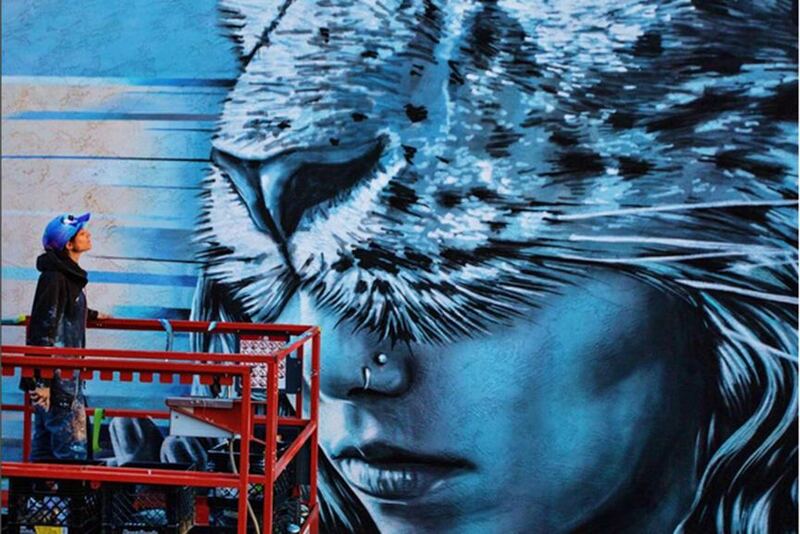 She is known mostly for her large mural works depicting female figures often done in collaboration with artists of similar interest like Fin DAC for example. 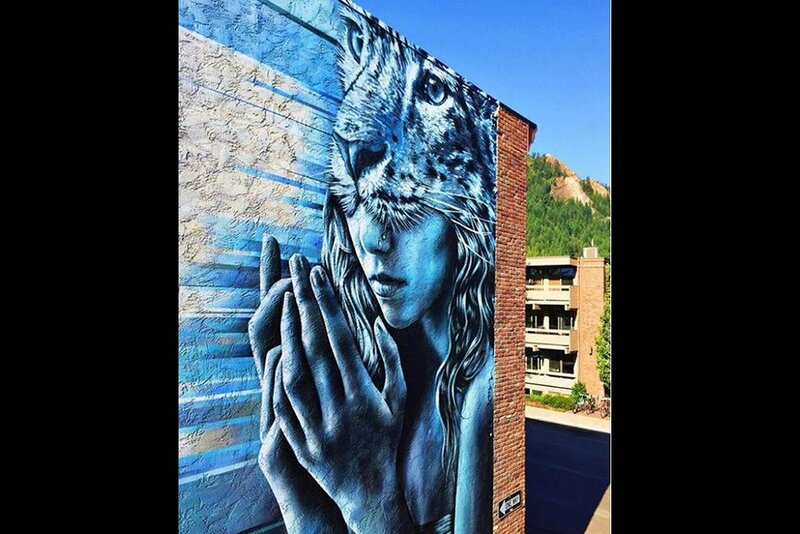 Christina Angelina’s astonishing portrait was done on the East side of the Crystal Palace building in Aspen, and it is a true celebration of female beauty as well as her artistry. Belgian artist Dzia Krank was one of the participants in the Meeting of Styles street art festival happening in his hometown of Antwerp. For the festival Dzia brought to life another of his signature highly detailed animal portraits. The leaping polar bear was done in Dzia’s recognizable graphic style of abstract and geometric lines. 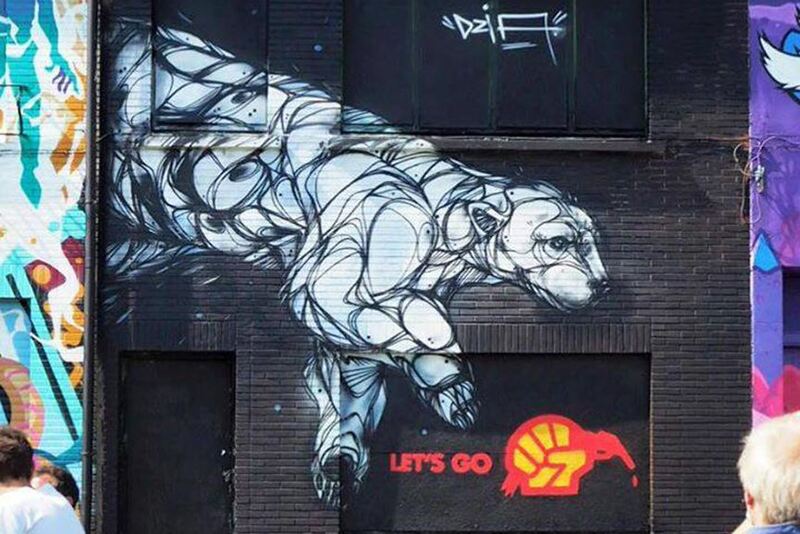 Entitled Save the Arctic, his piece centers on the idea of preserving this vulnerable and endangered species of North Pole inhabitants. 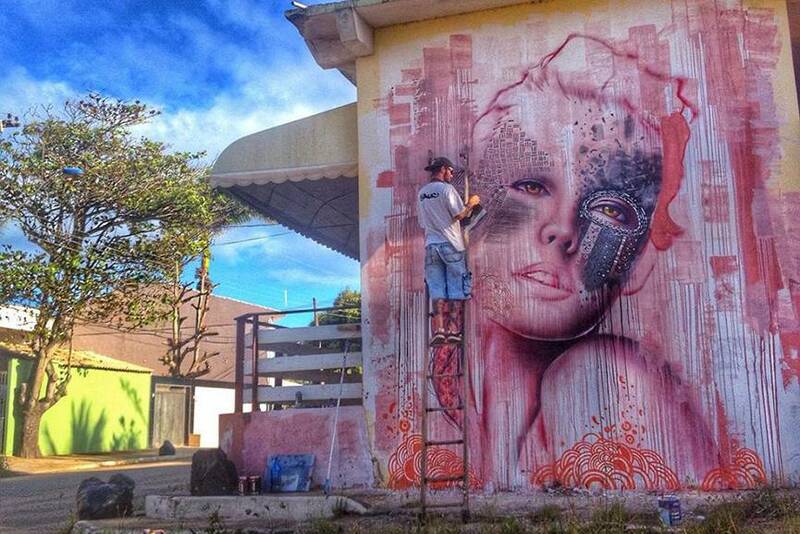 Create your profile via My Widewalls for free and stay up-to-date with all new murals created worldwide!